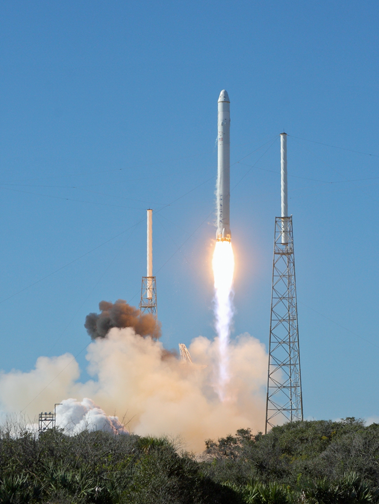 Over the past four months, officials at the Federal Aviation Administration (FAA), the US Air Force (USAF), the National Aeronautics and Space Administration (NASA), the National Transportation Safety Board (NTSB), along with several industry experts, have collaborated with SpaceX on a rigorous investigation to determine the cause of the anomaly that occurred September 1 at Space Launch Complex 40 (SLC-40) at Cape Canaveral Air Force Station in Florida. A SpaceX Falcon 9 launch vehicle during liftoff. This investigation team was established according to SpaceX's accident investigation plan, as approved by the FAA. As the primary federal licensing body, the FAA provided oversight and coordination for the investigation. Investigators scoured more than 3,000 channels of video and telemetry data covering a very brief timeline of events—there were just 93 milliseconds from the first sign of anomalous data to the loss of the second stage, followed by loss of the vehicle. Because the failure occurred on the ground, investigators were also able to review umbilical data, ground-based video, and physical debris. To validate investigation analysis and findings, SpaceX conducted a wide range of tests at its facilities in Hawthorne, California, and McGregor, Texas. The accident investigation team worked systematically through an extensive fault tree analysis and concluded that one of the three composite, over-wrapped pressure vessels (COPVs) inside the second stage liquid oxygen (LOX) tank failed. Specifically, the investigation team concluded the failure was likely due to the accumulation of oxygen between the COPV liner and over-wrap in a void or a buckle in the liner, leading to ignition and the subsequent failure of the COPV. Each stage of Falcon 9 uses COPVs to store cold helium, which is used to maintain tank pressure, and each COPV consists of an aluminum inner liner with a carbon over-wrap. The recovered COPVs showed buckles in their liners. Although buckles were not shown to burst a COPV on their own, investigators concluded that super chilled LOX can pool in these buckles under the over-wrap. When pressurized, oxygen pooled in this buckle can become trapped; in turn, breaking fibers or friction can ignite the oxygen in the over-wrap, causing the COPV to fail. In addition, investigators determined that the loading temperature of the helium was cold enough to create solid oxygen (SOX), which exacerbates the possibility of oxygen becoming trapped as well as the likelihood of friction ignition. SpaceX is targeting return to flight from Vandenberg's Space Launch Complex 4E (SLC-4E) with the Iridium NEXT launch on January 8 (Please see http://www.satnews.com/story.php?number=1267433707). SpaceX greatly appreciates the support of their customers and partners throughout this anomaly investigatin process, and the company looks forward to fulfilling their manifest in 2017 and beyond.